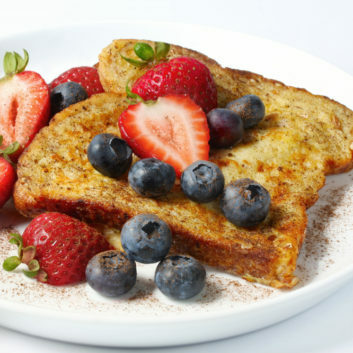 I match hearty whole-grain bread with the warm, comforting flavor notes of vanilla, cinnamon, and nutmeg to make a lighter, healthier version of traditional French toast. In a small bowl, whip the whole egg plus the egg white with the cinnamon, nutmeg and vanilla extract. Generously coat a skillet with oil spray and preheat over medium-high heat. Dunk and coat both slices of bread in the egg mixture. Place the bread slices in the skillet and cook for 1 to 2 minutes per side, or until crisp. Drizzle each slice with 1 teaspoon maple syrup (or dust each slice with 1 teaspoon confectioner’s sugar).